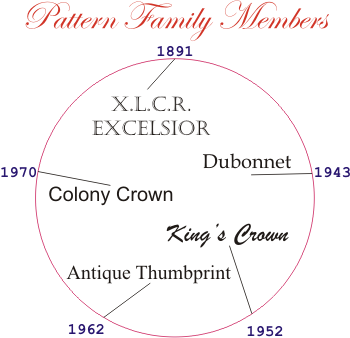 A visual on-line identification guide to all things King's Crown Glass. New images of Indiana Glass' 'Wedding Bowl, 5in.' in Satin Mist, Red. New Images of US Glass' 'Pitcher' in Crystal. Indiana Glass' 'Wedding Bowl, 5in' in Milk Glass with tall rim variant. U.S. Glass' XLCR 'Nappy, Covered, 6in.' in Crystal. The footed bowl with matching lid came in 5 sizes: 5in to 9in diameter. U.S. Glass XLCR 'Orange Bowl' in Crystal. Fun fact, although by the late 1950 all color staining from Indiana Glass/Colony was done by machine, Gold & Platinum couldn't be automated; each and every piece had to be hand painted. ...added to our ever growing collection of colors! New images of US Glass' 'Goblet' in Milk Glass added to our existing images of this in Ruby and Cranberry stain.